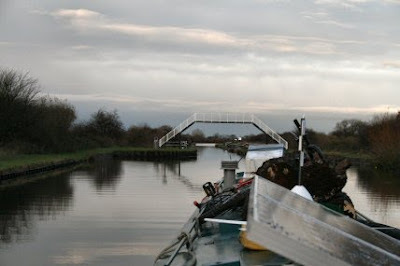 narrowboat_Abigail_Jenna: New Junction - not a corner or curve for miles! First thing from the bows. The day started right enough with the traffic being rather busy for a gloomy Sunday morning. 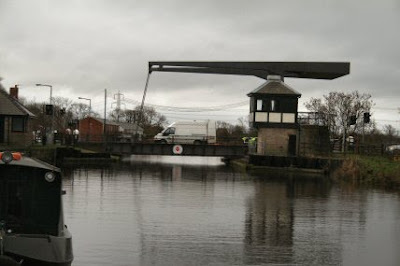 It all began with someone parking a van on the lift bridge and cutting through what seemsed like metal on the road way. Being a Sunday there wasn't a great deal of traffic about luckily. 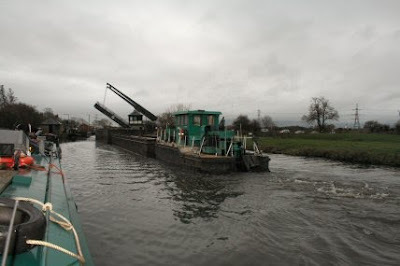 Within a short while of the van going away along come Swinton II and a couple of empty barges. Off to the works at Long Sandall perhaps. Then in the other direction came Sobriety and Arcadia on their way home no doubt. By now it was belting down with rain so we postponed moving till a clear bit arrived for the Doncaster area. 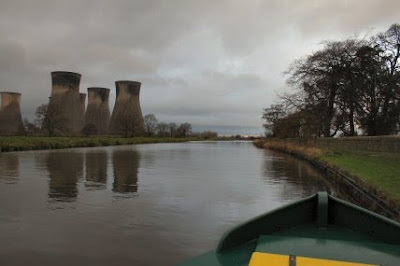 As soon as it slackened off we left but when we reached the turn off to Bramwith the clear patch decided to follow that line rather than us. It wasn't all bad as eventually the sun came out and we were treated to a double rainbow that was quite intense at the ends. The sad thing with New Junction is that it is dead straight for the whole of its length but at least you have a view over the fields on either side. Very flat. Two thirds of the way along comes the lock. This has a swing bridge in the middle that needs to be left open to stop the traffic all the time you are using the lock. We know! To save time I closed the bridge except that the sluices of the top gate now won't work so I open up again and things worked just fine. The little boat on the left is Eric of Lincoln. I will have to look this on up as I never heard of this well known viking Eric the red yes. The end of the New Junction is marked by the footbridge. 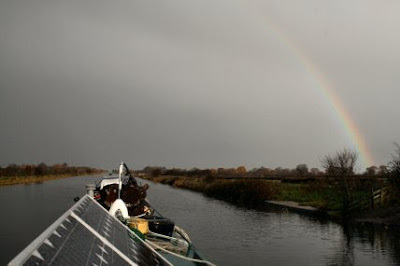 There are moorings just the other side and thats were we will stop for the night. The canal forms a 'T' junction at this point. 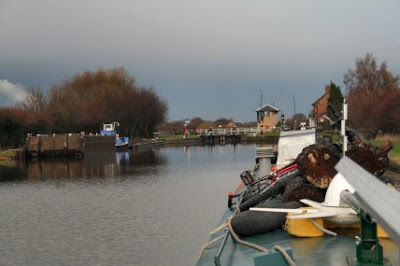 Turn right for Goole and left for Castleford while on the other side of the canal in front is a large reservoir that is used as a sailing boat club and further off there are large wind turbines.